When looking for help to deal with the problems arising from disasters we turn to our trade associations and other groups that we know. However, many of us can become siloed with a group of people who think just like us, almost by default. Canada has a large number of organizations over many different disciplines dedicated to planning for and dealing with disasters. This webinar will let you know who else may be out there, what you can learn from them, how they relate to you. 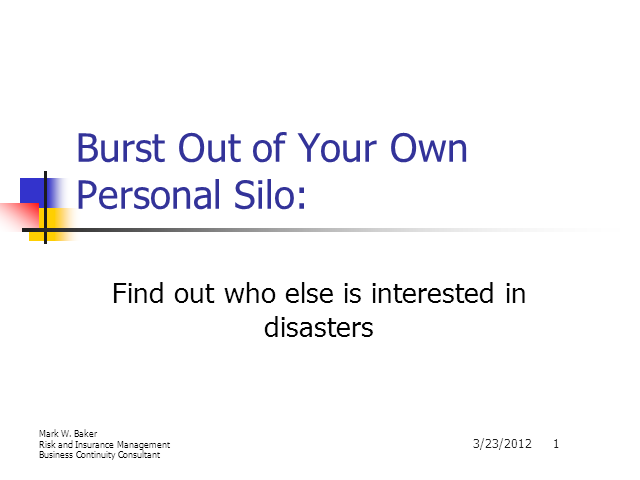 It provides a practical way to start to bust out of your own personal silo.